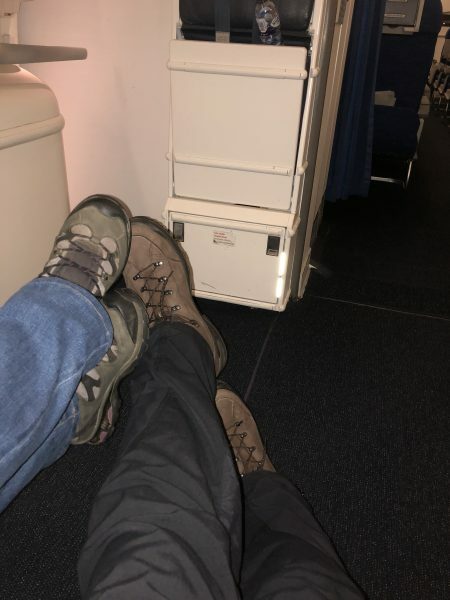 Overnight flight from London to Buenos Aires – a long 13+ hours but with it taking off just as we would normally go to bed and having the extra space of emergency exit seats, we both managed some sleep. The couple of glasses of wine taken in the BA Lounge prior to take off might also have helped! Very soon into the flight and we realised the extra we paid for ‘extra leg room’ seats were worth every penny and gave us a front row seat to watch folk attempting to get into the toilet. Now I’m not the sort of guy that hangs around loos but it did appear that at least half the flight couldn’t manage the basic action of ‘push to open’ despite there being a sign! Arrived at 9am local time and were transferred directly to the hotel where thankfully our room was ready. Time for a couple more hours sleep before heading out to explore the city. When we booked the trip we were offered an extra free night in the hotel and were really pleased we took it as we had the chance to see the city without the constraints of being part of a large group. 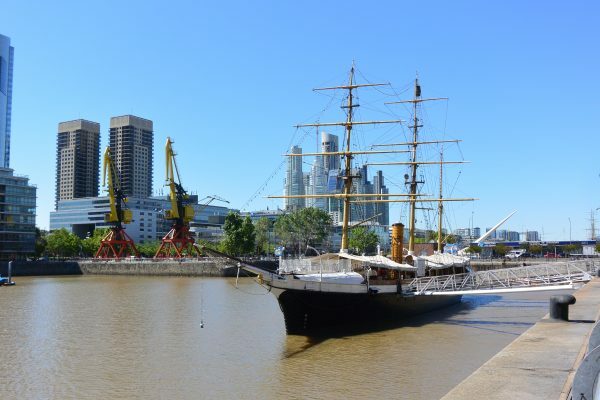 After finding a cafe for the obligatory #clewleystopsforcoffee we headed to Puerto Madero, the riverside port area which has undergone a lot of development – we compared it to Canary Wharf in London with all the tall glass buildings and converted wharfs. Had our first dinner of steak and Malbec at Bahia Madero and this combination became quite a habit over the next couple of weeks! After a decent night’s sleep and an early breakfast (jet lag!) we set off to La Boca despite having been on the way from the airport it’s not safe to go to without a guide (funnily enough it was a guide telling us this!). We stuck to the main roads at at no point did we feel unsafe but like all big cities you just need to keep your wits about you. We wandered along the riverside at Puerto Madero to the Puente Transbordador which is quite a stunning transporter bridge dating from 1908 and crosses the rather smelly Rio Riachuelo. 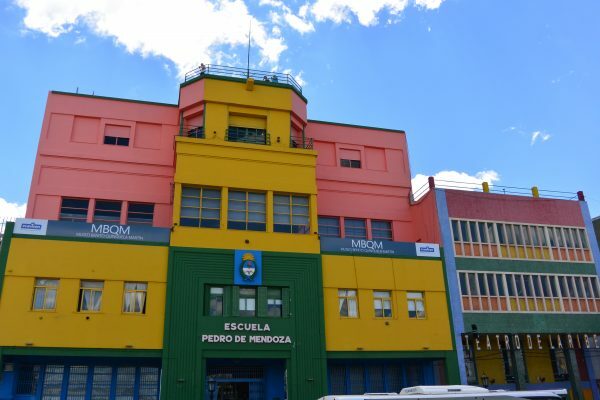 From there we entered the vibrant and colourful world that is La Boca. Quite a busy area that started as the city’s first port and an African slave colony before the Italian immigrants settled in 1880. It’s still quite a poor area but while money might be missing colour certainly isn’t. From there we wandered past a football ground (June will tell you more about that I am sure. Bob – that would be the home of Boca Juniors, one of the biggest clubs in Argentina!) and into the busy Plaza Dorrego, an old square full of bars and restaurants where of course we had to stop for a quick beer #JustTheOne of course! That night the tour proper began and we met up with the rest of the group with whom we will be spending the rest of the trip. Given the early morning we had coming up on Monday we also visited a tango show that night. The dancing was brilliant but it was a shame the band and dancers looked bored! The following day we took the organised city tour which took us to visit the Recoleta Cemetery, Plaza de Mayo and La Boca to name just a few places we saw. The cemetery is worth a visit and not just because it is the final, final resting place of Eva Peron (long story!) but to hear the stories behind some of the other mausoleums. The Plaza de Mayo is party to many stories which shaped the Buenos Aires and Argentina we know today. Well worth taking a guided tour. Dinner tonight was our first of three visits to El Establo, a steak restaurant almost opposite the hotel – great food and good value. After a 2am breakfast (no, that is not a typo!) 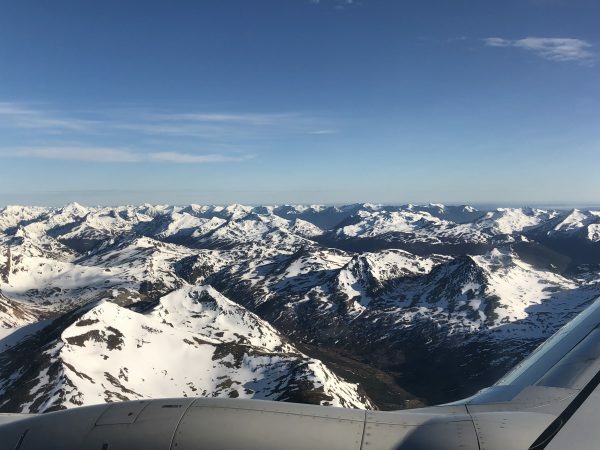 it was off to the local airport for a 4.30am flight south to Ushuaia. After a stunning flight in, we arrived to find the town basking in a positive heatwave with temperatures peaking at 20C! We stayed at the Villa Brescia Hotel located on the main street close to the shops and restaurants. After breakfast number 2 and lunch we took the optional tour to the Harberton Estancia to visit the penguins. 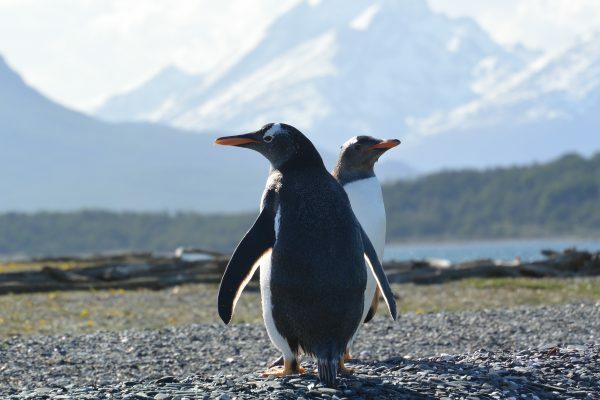 We didn’t see as many as anticipated as it’s nesting season so many of the birds were sitting on their nests in burrows underground but we did get to see three types of penguin: the Magellanic and Gentoo plus a lone King. Fascinating creatures to watch. The estancia also has a small museum and research facility focusing on the local marine life. 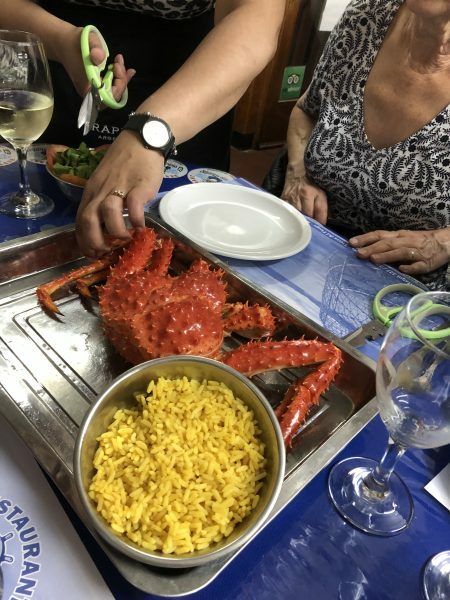 King crab is one of the local specialties so dinner had to involve it somehow although we couldn’t be bothered to faff with pulling a whole crab apart so opted for meals where that was already done. Dinner was at El Viejo Marino – not much to look at from the outside but great food. 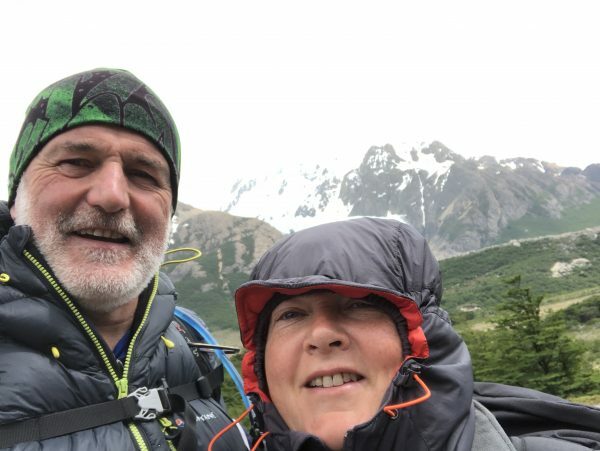 A more reasonable start today and it was off for the first walk – a gentle 8km stroll around part of the Tierra Del Fuego National Park and an inkling of the scenery we were going to see over the next couple of weeks. We thought this area was quite stunning but how little did we know! 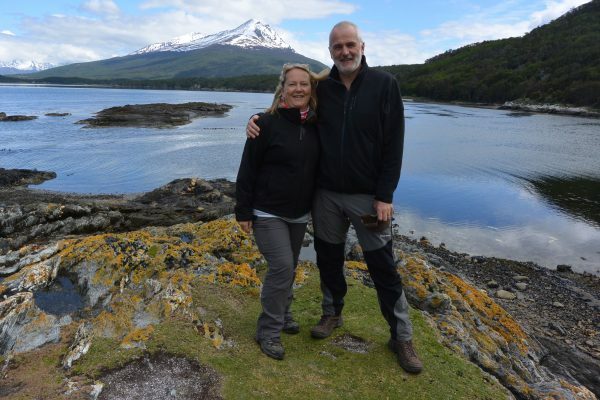 The afternoon was spent taking a trip across the Beagle Channel. Stopped at a couple of islands to see sea lions but not much to say other than it’s unlikely we’ll ever get much further south in the world! A long, long day on a coach as we travelled from Ushuaia to Punta Arenas. 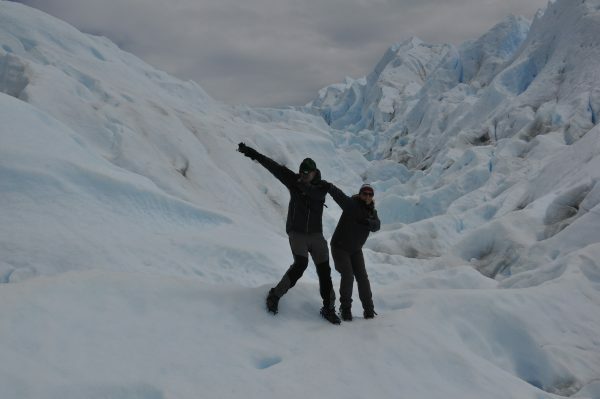 This involved crossing the Argentina/Chile border as well as a ferry across the Magellan Straits. Away from the mountains the scenery is all undulating steppes so not much to look at but the coach was comfy (as coaches go) and therefore plenty of opportunity to catch up on missed sleep. Just a warning – they are very strict on what crosses the border in terms of fruit and other foodstuffs and there are BIG bins for all the prohibited stuff! Hotel for tonight – Hotel Savoy. Bit wacky in its furnishings having seemingly kitted out its rooms from a car boot sale( we had 3 beds, a full size fridge and a computer desk complete with pull out keyboard tray and others in the group reporting equally strange items in their rooms). Clean though and perfectly fine for an overnight stay. A change from Argentinian wine and now on to equally good Chilean and still in seafood mode! After a quick scoot around the town on the bus we headed to Puerto Natales where we stopped for lunch and a quick supermarket shop to buy lunch stuff and snacks for the next couple of days (oh and a small box of wine or two may have fallen into the trolley plus a pack of Cusquena beer!) as where we were heading next, there was little opportunity to buy anything. Big walking day! 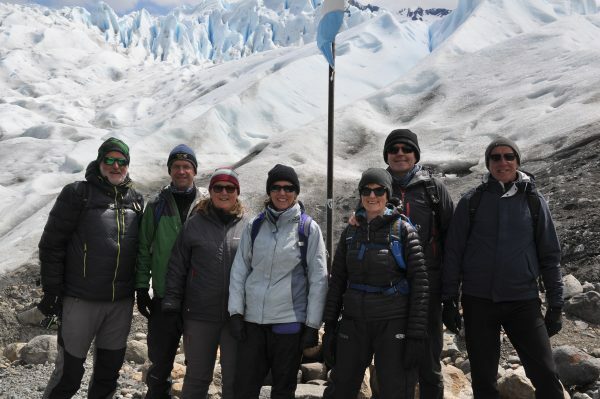 One of the optional trips on offer was a 20km round trip hike to the base of the Torres Del Paine and it was one of our favourite days. The day began with an hour’s coach ride through the National Park to the visitor’s centre which gave us the opportunity to scope out the area for a potential future visit in a motorhome (that’s a whole story in itself). It was then straight into the walk which was uphill to start with, then a flat section through the woods and finished with the last 1km up steep moraine but the view at the end was well worth it…. With not much else to do and feeling thoroughly exhausted it was straight to bed after dinner! 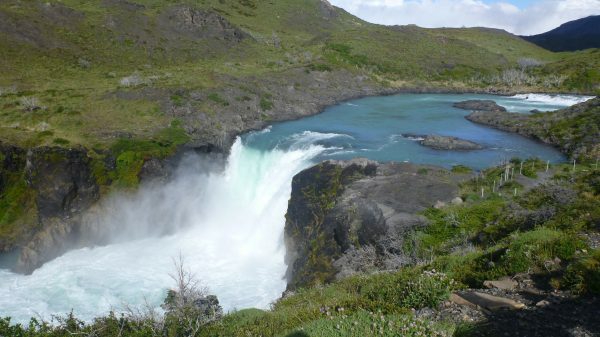 Back into the National Park, driving along the edge of Lake Pehoe and a short walk to the Cuernos lookout via the waterfalls at Salto Grande. 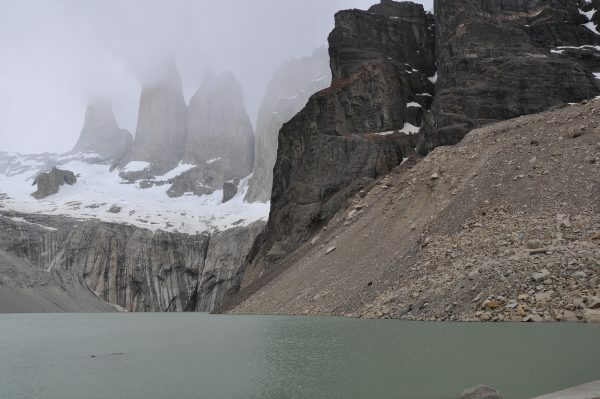 We have been so lucky with the weather and have had the most amazing views of the Torres. 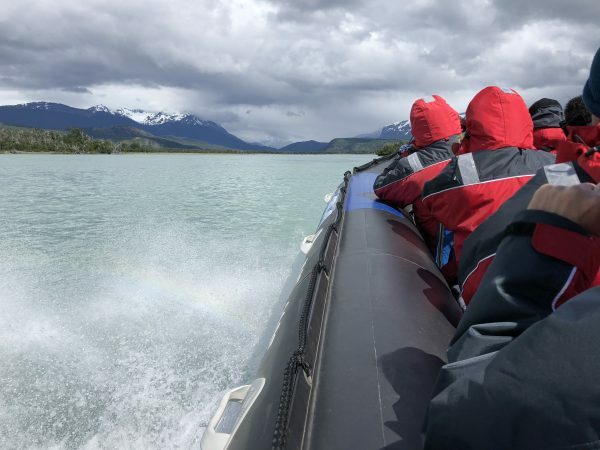 Today’s optional trip was an afternoon on a rib out on the Serrano River to the Serrano Glacier. 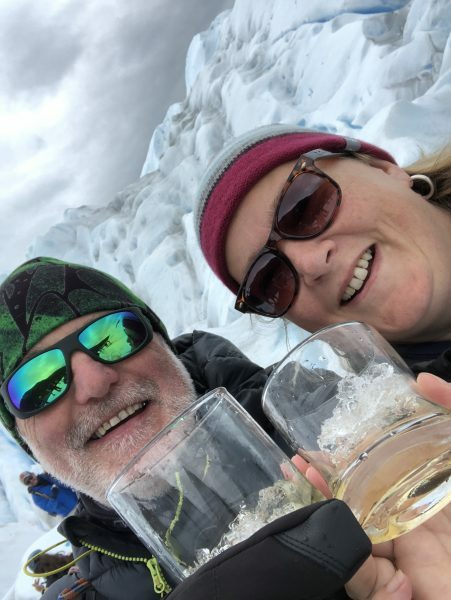 Great fun zipping across the ice cold waters fully kitted out in warm, waterproof clothing (all provided by the boat company) and then a short walk to the glacier. Another of our top trips from the holiday. 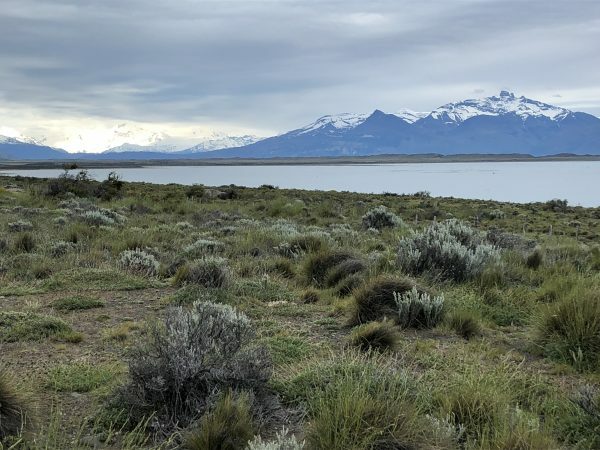 A second long travel day as we head back to Argentina and tonight’s location is Calafate – only a short distance as the crow flies but with the terrain and border crossings it takes most of the day. 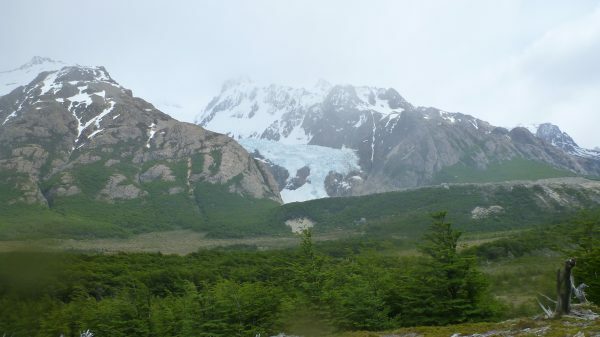 Away from Torres Del Paine the scenery returned to the rolling steppe but we weren’t ever too far from the mountains. 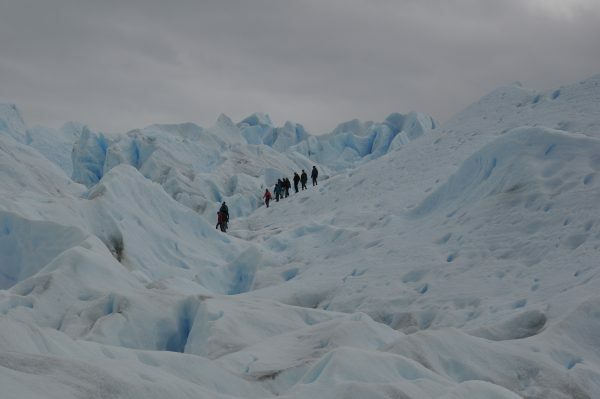 From there it was along the southern edge of Lago Argentino, a stunning turquoise lake, to Calafate on the edge of Los Glaciares National Park. It’s a buzzy little town full of bars and restaurants and here we had our first taste of Patagonian lamb cooked on a BBQ with a difference. 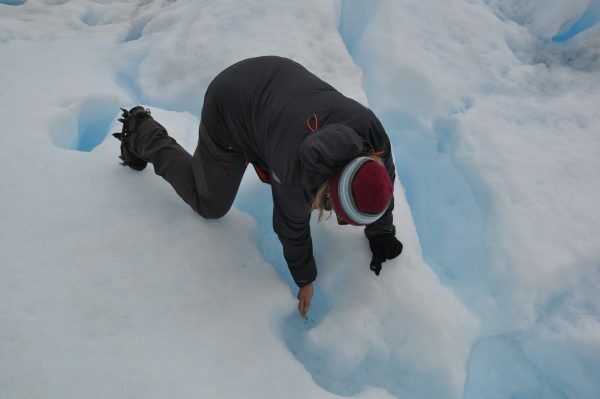 One of the drivers for us booking this trip was the glaciers and the opportunity to get up close to them and with today’s activity, actually on them! 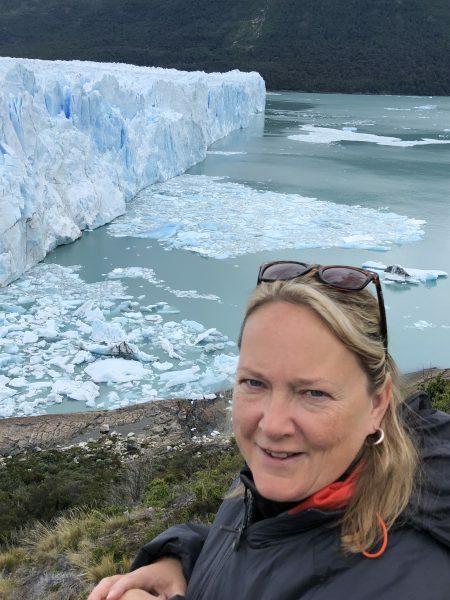 We visited the Perito Moreno Glacier and spent the morning in the main visitors area which gives views across the end of the glacier. It was mesmerising just standing and watching the glacier, trying to spot where the next chunk would fall, and listening to the constant creaking, cracking and rumbling as it moved. 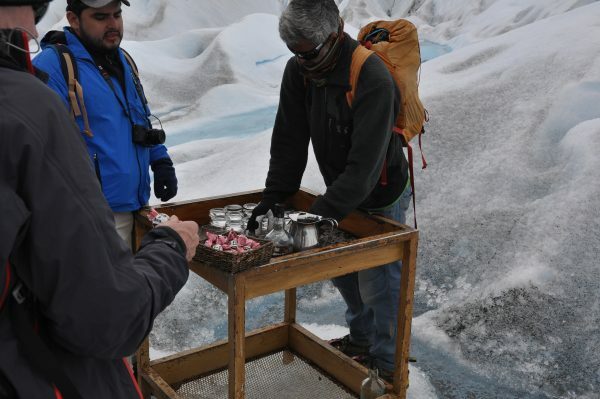 The excursion finished with chocolate and scotch on the rocks with ice chipped straight from the glacier! 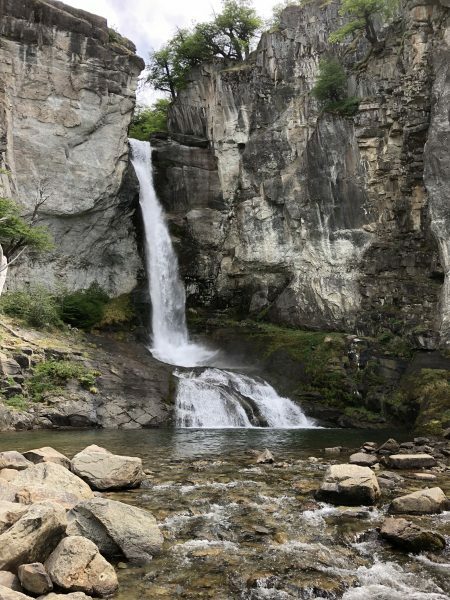 Today we moved from Calafate to El Chalten and on the way we had our first stop at Parador La Leona (www.hoteldecampolaleona.com.ar), allegedly Butch Cassidy hid out there for a while) on Route 40 which is one of the main tourist roads across Patagonia. 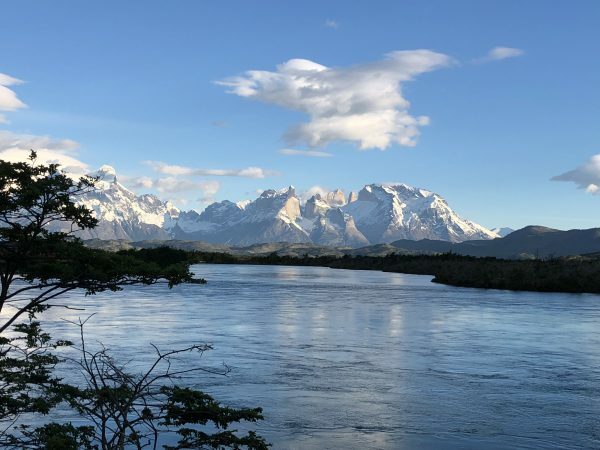 El Chalten is a very small town within Los Glaciares National Park and a base for hikers and climbers to access the Fitzroy Massif. Freetime in the afternoon allowed us to follow a small trail along the De las Vueltas river to the Chorillo del Salto waterfall. 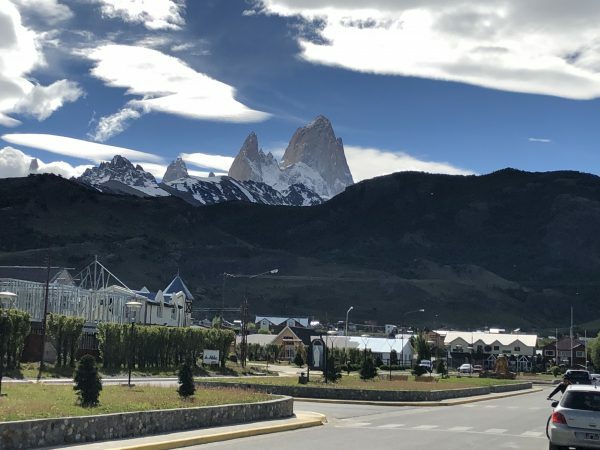 Clear skies also meant we could see most of the Fitzroy Massif from the town centre which is quite a rare event as it is almost always covered in cloud (the indigenous Tehuelche called it Chalten which means Smokey mountain). 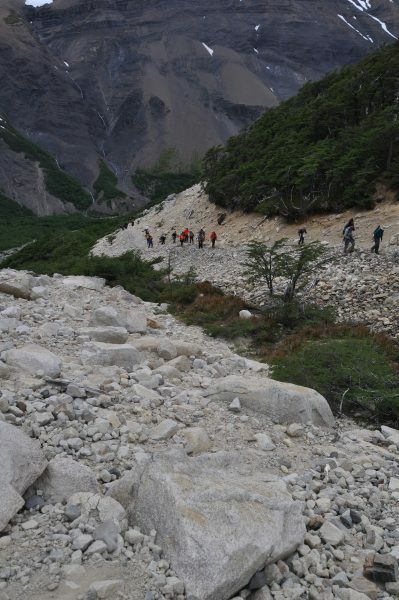 Our second and final long trek of the holiday was into the Fitzroy area but unfortunately the weather did finally catch up with us and it was too windy to do the final few kilometres of the 21km trek. 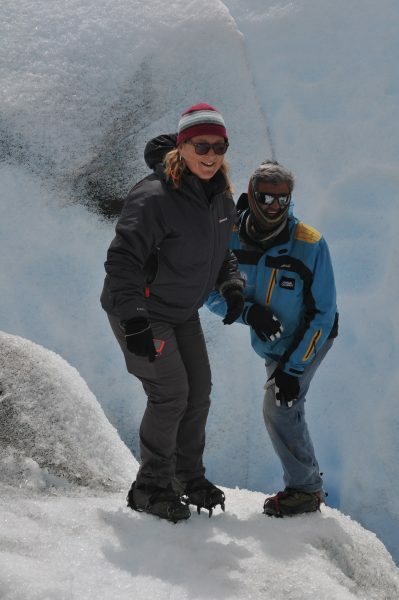 We did manage to walk along a little further at a lower level to see a hanging glacier. Leaving at 10.30am to get our flight back to Buenos Aires didn’t leave time to do too much in the morning other than have a leisurely breakfast but that was a bit of a novelty in itself! 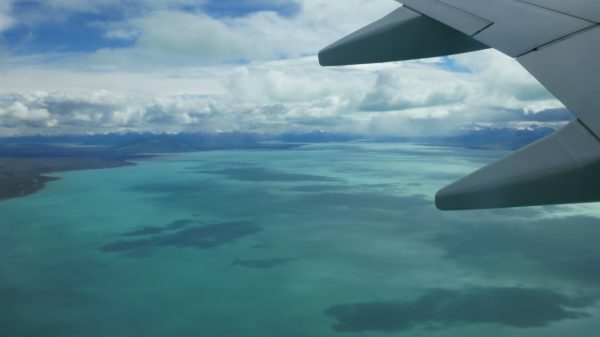 The flight out took us over Lago Argentino where we could truly appreciate the colour of the lake. It was back to our favourite hotel in Buenos Aires and into one of the tiniest, noisiest rooms we’ve ever stayed in but luckily it was only for one night! Dinner was back at El Establo as a group as this was the last night of the basic tour; only ten of us were doing the Iguazu extension. 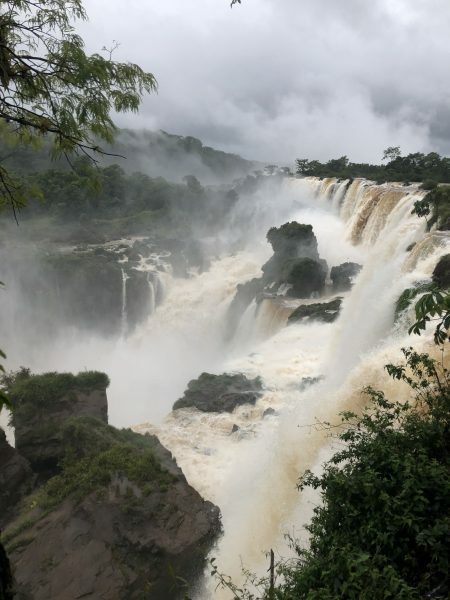 Having left the cold weather gear behind in BA, we took the short flight to Puerto Iguazu to stay in the Argentinian side of the falls at the Exe Cataratas Hotel. Definitely a more luxurious hotel than the others we had stayed in with a reasonable restaurant and swimming pool but we did lose the power a few times during heavy rain (the rain was only to be expected given we were in the rainforest!). 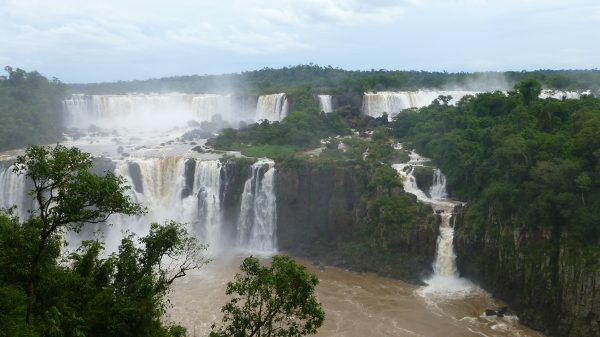 After lunch a short bus ride saw us in our third country of the trip – Brazil, where we got a spectacular view of the full extent of the Iguazu Falls and got a little damp as we walked along the various paths out over the water. 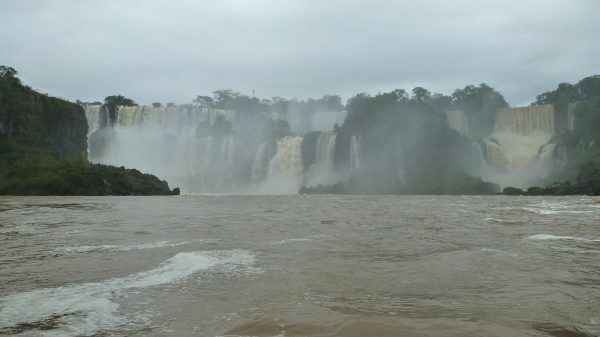 No more border crossings as today was spent on the Argentinian side of the falls, exploring the falls at different levels including going into the falls on a boat! 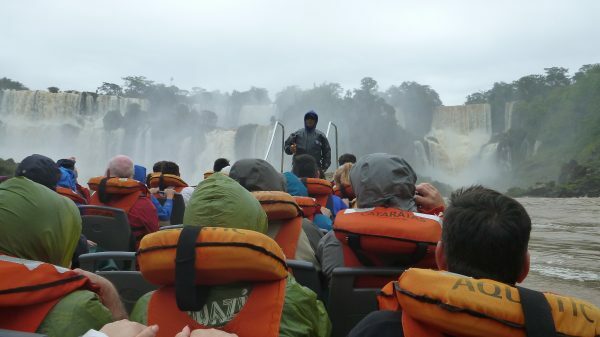 We signed up for another optional tour which took us on the back of a truck for a short journey through the rainforest and down to a dock to pick up the boat which took us into the Falls. Needless to say we got very,very wet but had great fun! A free morning spent by the pool before heading back to the airport and BA for the final time. Total chaos at the airport as the check in / luggage systems had gone down and given the airport only had two gates, it wasn’t long before the entrance hall filled up and the arguments began; nothing for us to do other that sit back and watch! We did finally get on the plane (with handwritten boarding passes and baggage tags) and were able to get our last view of the Falls from the plane. Final night in BA in the Hotel Waldorf and because we hadn’t had a bad meal there, dinner for the few of us left was in El Establo again. Our last morning saw another leisurely start as there was no real time to go anywhere before being picked up for the transfer back to the airport. 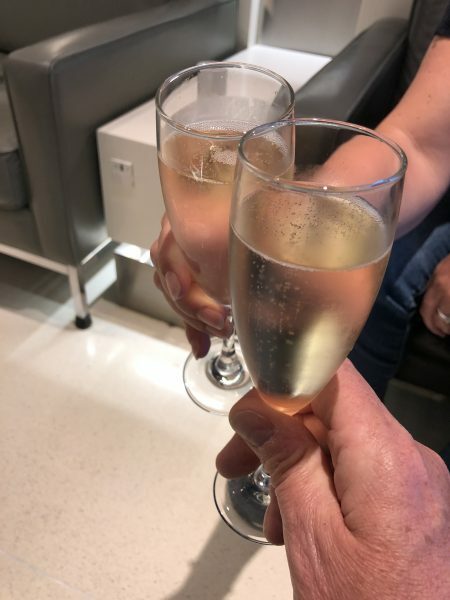 It was great to be able to use the lounge again as we had a couple of hours to kill there but it was an uneventful flight home arriving as one of the first flights in to Heathrow the following morning. Safe to say this was a trip of a lifetime and we both ticked off bucket list items. Yes it was full on and we were constantly on the go, but we saw and did so much. 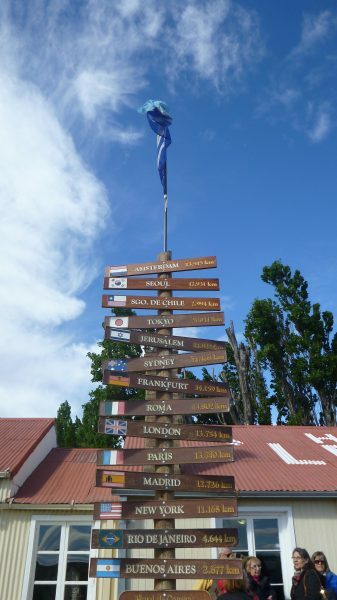 Now to think about the next trip…….